Description: This is a war of gods. Here, four gods representing the four different factions come together to do battle. Join the fight to test your might alongside hundreds of servers at the same time! Participation requirement: All Lvl. 50+ players with battle ratings in excess of 300k can join in this event only if you vote during the Vote Period. For those who don't vote, they cannot do battle in the whole event, that's to say they cannot experience the most exciting Divine War. By the way, if you are qualified to compete for Hero of your server, don't miss the Sign-up period, while if you just want to join in this event, you just need to vote during the voting period and don't have to sign up. In each battleground there are 4 factions: Gods, Humans, Trolls, and the Undead. Each of these represents a different element and guardian as shown below. The Gods: Masters of the Heavenly Winds, Odin. The Humans: Masters of the Sacred Earth, Thor. The Trolls: Masters of the Dark Fire, Loki. The Undead: Masters of the Styx Waters, Hel. 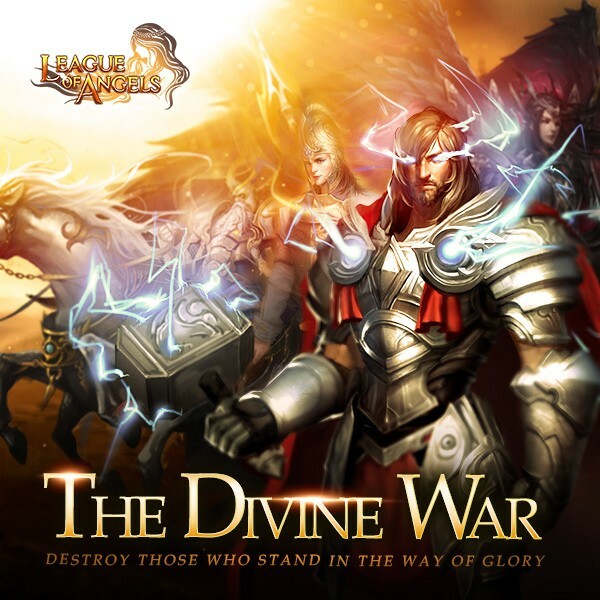 The Divine War is comprised of five stages: Hero selection, Faction selection, Commander selection, Divine War, and Hall of Glory. Hero selection is made up of two stages: Sign-up and Voting. 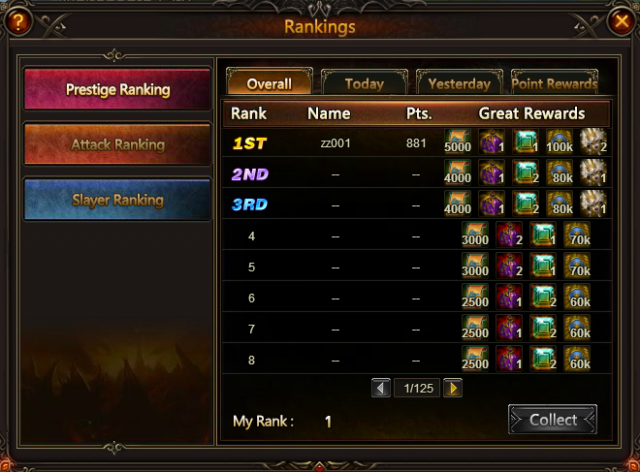 Sign-up Requirement: The top 15 players in the Battle Rating rankings are qualified to sign-up for Hero selection. If you want to be the Hero of your server, please don't miss this sign-up period! If no players sign up during the event period, the top 5 players in the Battle Rating rankings will be automatically signed up. Voting Requirement: Lvl. 50+ characters with battle ratings in excess of 300k. Don't forget to vote, because if you miss the voting period, you cannot participate the event. 1. Qualified players can vote at least once per day. 2. Vote attempts are based on VIP level. The higher a player’s VIP level, the more vote attempts s/he will have. 3. Players can vote for themselves. 4. Players earn rewards each time they vote. 5. If there are not enough players signed up for the event, the other participant will be selected from the top 5 players in the Battle Rating rankings. 6. Players who successfully run for Hero or vote are qualified for the Divine War. 7. Note: Once the voting period is over, players cannot join the Divine War anymore. - The player who earns the most votes by the end of the voting period will be selected as the server’s Hero. - If more than one player has the same number of votes, the one with the higher battle rating will be selected. What are a hero's privileges? - A Hero can draw to select his server’s faction. - Hero can use exclusive Buff Scrolls in the battleground. - Winning Heroes can earn fantastic rewards. Description: Once the Heroes are selected, they will draw to select a faction. - Only the Hero of the server can draw to pick the server. - After join a faction successfully, each faction can select one Commander from the Heroes. Description: All Heroes can run for Commander. 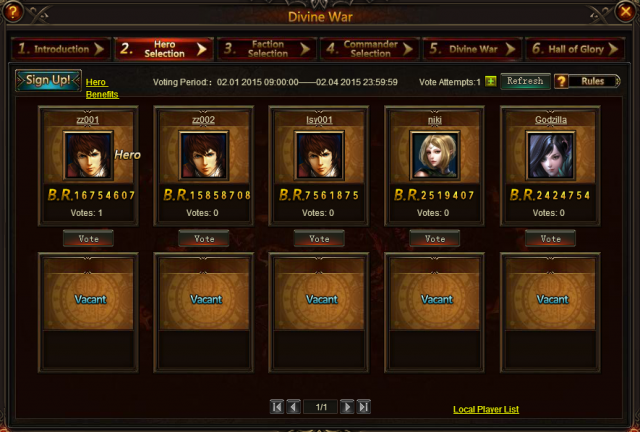 - Heroes of each server automatically become Commander candidates. - Each vote earns the voter a reward. Vote attempts can be purchased. Who Becomes a Grand Hero? - The player who earns the most votes by the time the voting period ends will be selected as the Commander of that faction. - If there is more than one player who has the most votes. The one with the higher Battle Rating will be selected. What are a Grand Hero's privileges? - Grand Heroes can cast Ultimate Skills in battle. - The winning Commander can receive fantastic rewards. 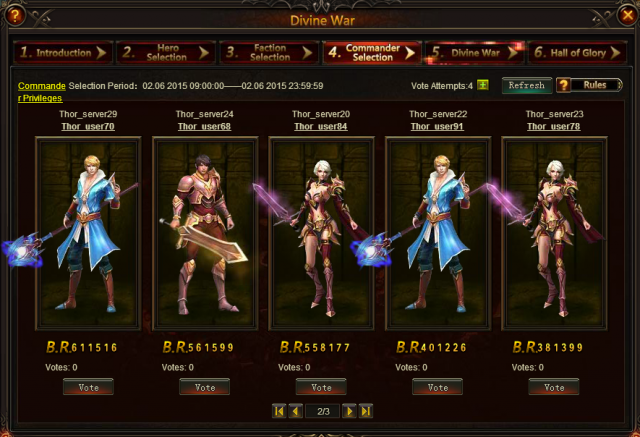 Description: The Divine War unlocks from 21:30 to 22:00 every other day. Generally, Divine War will unlock on even number date and lock on odd number date. In this event, the Divine War will unlock on 21:30 to 22:00 Sep 22, 21:30 to 22:00 Sep 24, 21:30 to 22:00 Sep 26. During the truce period, you can hurry up to raise your battle rating, upgrade your weapon, and also you can move to accessible cities and make any possible preparations for the war. There are Gods, Humans, Trolls, and the Undead, each of these 4 factions occupies its own city. The Divine War unlocks from 21:30 to 22:00 every other day. Players will fight to win more power for their faction. Movement: Click on a city and click on the move button to move into the city. 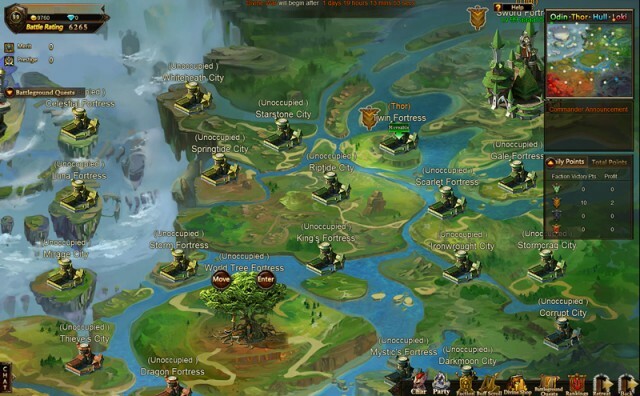 Players cannot pass cities which belong to other factions to reach the target city. Movement Range: During times of peace, players can move to cities that belong to them as long as the route to the city is open (Green arrows will point to them); During war, players can move to their cities and to target cities that belong to other factions as long as there is an open route to them (Red arrows will point to them). Upon making a move, a Movement CD will appear. CD duration is based on the distance between the 2 cities. CD can be removed by waiting or accelerating. Click on a city to enter. Players cannot enter a city while in CD. How to occupy a city? First, clear all NPCs from the Bases and Trenches. Second, clear all NPCs who protect the Tower in the city center. 1.Move: enter a battleground by clicking on a city. Your character will appear in the city’s entrance. 2.Move/ Attack: click on an adjacent space to move or attack if there are enemies in that space. Players who own the city can move to the Trenches or the Tower to defend their city. 3.Battle CD: After each attack, there will be a CD in which players cannot move, initiate attacks or be attacked. 4.Buff Scrolls: Buff Scrolls can be used in a battleground. Click on Buff Scrolls and trigger them on a target within the effect range. 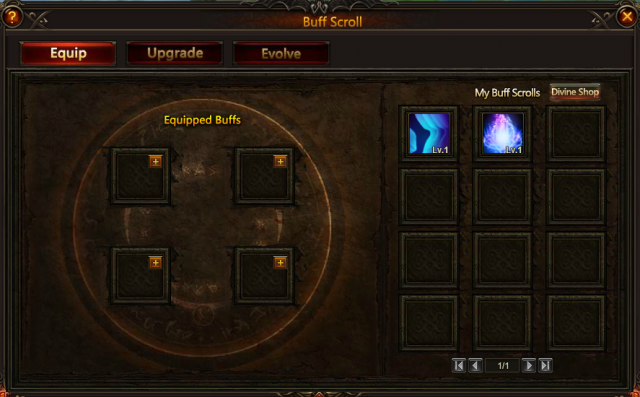 Each Buff Scroll has it’s own special effects. 6.Attack Priorities: When attacking Bases and Trenches, attackers will first battle with players if there are players defending the space. When attacking Towers, attacking will first battle with NPCs who are protecting the Tower. Attackers who tear down the Tower will occupy the city. Each movement or attack consumes 8 movement points. 5 points recover every 5 seconds. Each battle adds 5 Fatigue Points, for each 5 Fatigue Points gained, ATK and DEF will decrease by 5%, 75% maximum. Each victory earns 5 points and each failure deducts 10 points. When morale decreases to 0, character will be sent back to the Faction City. Besides, we add a Faction channel in Chat Box. Players in the same faction can communicate there. 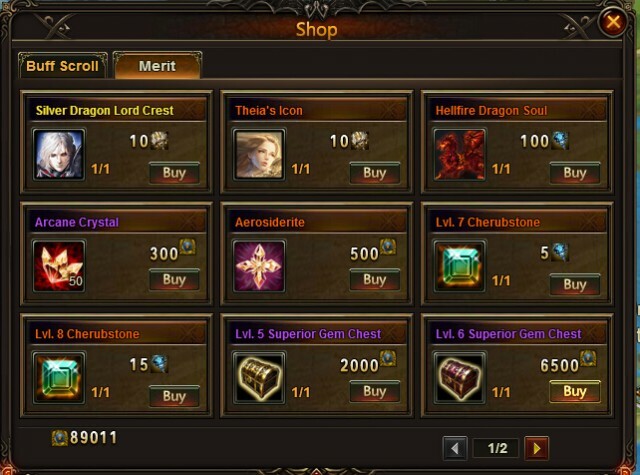 In Divine Shop, you can use Divine Mark , Divine War Emblem or Merit to buy various items, which include different kinds of Buff Scrolls, Silver Dragon Lord Crest, Theia's Crest, Hellfire Dragon Soul, Arcane Crystal (required material when using a Buff Scroll), Aerosiderite (required material in Buff Scroll evolution), Lvl. 8/7/6/5 Cherubstone, Lvl. 6/5 Superior Gem Chest, Angel Tears and many other items. Description: In hall of Glory, you can collect rewards based on your performance. Grand Hero from the winning faction and players who rank higher in Prestige Ranking will show up on the throne and receive praises from other participants. For more detailed rules and information, please check in game. Now hurry up to raise your battle rating and prepare for this grand event! More exciting events are coming up through Sep 15 to Sep 29, check them out in the in-game Hot Events menu now! LoA_Djinni's Merchant: Get What You Want! LoA_Angel's Quiz: Get Wings of Vengeance! LoA_Play Wheel of Luck and Win Hot Items! LoA_Awaken Eostre in Resource Tycoon! LoA_Awaken Polly in Angel Exclusive! LoA_Enjoy Beach Treasure and Rose Ranking!